The Bahá'í Faith is a religion founded by Bahá'u'lláh in nineteenth-century Persia. Members of the Bahá'í faith understand history as an evolving educational process for humankind, brought about by God's religious messengers known as “Manifestations of God.” Bahá'u'lláh is seen as the most recent and pivotal, but not final of these messengers. He is viewed as the long-expected educator and teacher of all peoples, allegedly foretold in the scriptures of Christianity, Islam, Hinduism, and Buddhism. It is said that his mission was to establish a firm basis for unity throughout the world, and inaugurate an age of peace and justice, which Bahá'ís expect will inevitably arise. Fundamental to Bahá'í teachings is unity: the unity of God, of religion, and of humankind. These principles have a profound impact on the theological and social teachings of this religion. Bahá'ís number around six million in more than two hundred countries around the world. The term "Bahá'í" comes from the Arabic word Bahá’ (بهاء), meaning "glory" or "splendor." Bahá'ís believe in a single, imperishable God, the creator of all things, including all the creatures and forces in the universe. God is described as "a personal God, unknowable, inaccessible, the source of all Revelation, eternal, omniscient, omnipresent and almighty." Though inaccessible directly, God is nevertheless seen as conscious of his creation, with a mind, will and purpose. Bahá'ís believe that God expresses this will at all times and in many ways, including through a series of divine messengers referred to as Manifestations of God or sometimes divine educators. In expressing God's intent, these manifestations are seen to establish religion in the world. Bahá'í teachings state that God is too great for humans to fully comprehend, nor to create a complete and accurate image. Bahá'u'lláh often refers to God by titles (e.g. the All-Powerful, or the All-Loving). Bahá'ís believe that this anthropomorphic description of God amounts to Bahá'u'lláh, in his capacity as God's manifestation, abstracting him in language that human beings can comprehend, since direct knowledge of the essence of God is believed impossible. Although human cultures and religions have different concepts of God and God’s nature, Bahá'ís believe that such varying views nevertheless refer to a single being. The differences between these religions are attributed to the varying cultural and developmental contexts in which the messages were propagated. Bahá'ís regard the world's major (and many minor) religions as one single faith, revealed by God's manifestations progressively and in stages. No one message, and therefore no one religion can be, according to Bahá'í belief, considered essentially superior to another—though a more recent message may be considered more relevant to humanity's current spiritual, social, and developmental context. Bahá'ís regard most other religions as divinely inspired, though see them as having been superseded by Bahá'u'lláh's more recent revelation; Bahá'u'lláh in many places states that denying the validity of any of the previous legitimate religious founders is equivalent to denying all of them (including himself) and to denying God. Bahá'í notions of progressive religious revelation result in their accepting the validity of most of the worlds' religions, whose founders and central figures are seen as Manifestations of God. These include, but are not limited to Jesus, Muhammad, Krishna, Abraham, Moses, and Buddha. Bahá'ís also believe that other religious figures, such as Adam, Noah, and Hud historically existed and were prophets of God. Religious history is interpreted as a series of dispensations, where each manifestation brings a somewhat broader and more advanced revelation, suited for the time and place in which it was expressed. Specific religious social teachings (e.g. the appropriate direction of prayer, or dietary restrictions) may be revoked by a subsequent manifestation so that a more appropriate requirement for the time and place may be established. Conversely, certain general principles (e.g. neighborliness or charity) are seen to be universal and consistent. Bahá'ís do not believe that this process of progressive revelation will end. They do, however, believe that it is cyclical. Bahá'ís do not expect a new manifestation prior to one thousand years after Bahá'u'lláh's revelation. Bahá'í beliefs are sometimes described as syncretic combinations of earlier religions' beliefs. Bahá'ís, however, assert that their religion is a distinct tradition with its own scriptures, teachings, laws, and history. Its cultural and religious debt to the Shi'a Islamic matrix in which it was founded is seen as analogous to the Jewish socio-religious context in which Christianity was established. Bahá'ís describe their faith as an independent world religion, differing from the other great religious traditions only in its relative newness and in the appropriateness of Bahá'u'lláh's teachings to the modern context. Bahá'u'lláh is believed to fulfill the messianic expectations of these precursor faiths. Bahá'ís believe that human beings have a "rational soul," and that this provides the species with a unique capacity to recognize God's station and humanity's relationship with its creator. Every human is seen to have a duty to recognize God and his manifestations, and to conform to their teachings. Through recognition and obedience, service to fellow humans and regular prayer and spiritual practice, Bahá'ís believe that the soul becomes closer to God, the spiritual ideal in Bahá'í belief. The material dimensions of space and time are seen as merely a component in the numberless "worlds of God" and the goal is to become detached from the worldly and move closer to God. When humans die, they pass into the next world, where their virtues gained in this world will help them with their relationship with God, analogous to the help they have received from their senses and limbs in the material world. Heaven and Hell are, then, spiritual states of nearness or distance from God. Free will is exclusive to this world, however, making one's progress in the next world dependent on one's actions and legacy in this world. The Bahá'í writings assert the essential equality of human beings, each having a unique relationship with God apart from humanity's collective relationship to the divine. Humanity is seen as essentially one, though highly varied; its diversity of color, gender, language, culture and style are seen as aesthetic flavor worthy of appreciation and tolerance. Several divisions such as race, nation, caste, and social class, are seen as purely artificial distinctions, on which basis no appropriate judgment may be made about a person. The Bahá'í teachings state that the unification of mankind is the paramount issue in the religious and political conditions of the present world. The Bahá'í writings affirm the biological, political, and spiritual unity of mankind while emphasizing the value of cultural, national and individual diversity. Three underlying core assertions expressed above are often simply encapsulated as three essential unities: the unity of God, the unity of religion, and the unity of mankind. This formulation is often helpful in understanding Bahá'í approaches to a variety of religious topics, though it belies much of the complexity found in the hundreds of books and letters that form the Bahá'í sacred texts. Much of Bahá'í practice and social teachings are rooted in these priorities (See Bahá'í teachings). The following 12 "principles" are frequently listed as a quick summary of the Bahá'í teachings. They are derived from transcripts of speeches given by `Abdu'l-Bahá during his tour of Europe and North America in 1912. The list is not authoritative and a variety of such lists circulate. The first three of this list are commonly referred to as the "three onenesses," and form a fundamental part of Bahá'í beliefs. Although it concentrates on social and ethical issues as well, some of the Bahá'í Faith's foundational texts might be described as mystical. Shoghi Effendi has called the "Seven Valleys" Bahá'u'lláh's "greatest mystical composition." It was first translated into English in 1906, becoming one of the earliest available books of Bahá'u'lláh to the West. In it, he follows the path of a wayfarer on a spiritual journey passing through different stages, calling them "Seven Valleys" or "Seven Cities." The goal of the journey is to follow "the Right Path," "abandon the drop of life and come to the sea of the Life-Bestower," and "gaze on the Beloved". The purpose of life in the Bahá'í scriptures is to acquire virtues, know God, develop spiritually, and help carry forward an ever-advancing civilization. The personal development is conceived as an organic process, like the development of a fetus, assisted by God's Messengers. Bahá'u'lláh taught of an afterlife in which the soul may progress infinitely through ever-more-exalted spiritual realms. Heaven and Hell are perceived as a reference to an individual's proximity to God, and not as exclusive or physical places. Bahá'ís believe that while God's essence can never be fully fathomed, he can be understood through his "names and attributes." These are likened to gems and include such divine qualities as compassion or wisdom. The purpose of God in revealing himself to mankind is to bring "the Mystic Gems out of the mine of man." Bahá'í spirituality tends to consist of textual study, prayer, and recitation. Monasticism is forbidden, and Bahá'ís attempt to ground their spirituality in ordinary daily life. Performing useful work, for example, is not only required but considered a form of worship. Bahá'ís have high regard for what is termed the "Greater Covenant," which they see as universal in nature, and from "time immemorial" has been carried through by the Manifestations of God of all ages. They also regard highly the "Lesser Covenant," which is viewed as an agreement between a Manifestation of God and his followers; the lesser covenant is viewed as unique to each revelation and includes the distinguishing characteristics of each revelation and the continuation of authority in the religion.At this time Bahá'ís view Bahá'u'lláh's revelation as a binding lesser covenant for his followers; in the Bahá'í writings being firm in the covenant is considered as one of the main religious virtues a person can work toward. With unity as an essential teaching of the Faith, Bahá'ís follow an administration that they believe is divinely ordained, and therefore see attempts to create schisms and divisions as insignificant, doomed efforts which are contrary to the teachings of Bahá'u'lláh. Throughout the Faith's history schisms have occurred over the succession of authority. The followers of the various Bahá'í divisions, who in total, number in the low thousands, are regarded as covenant-breakers and shunned, essentially excommunicated. Shoghi Effendi described the period from the Báb's 1844 declaration in Shiraz, to the 1921 death of `Abdu'l-Bahá as the "Heroic Age" of the religion. During this period its early believers experienced severe persecution and its foundations were established in several countries around the world. The period after 1921 is described as the "Formative Age," characterized as coinciding with the Bahá'í Faith's emergence from obscurity, by the establishment and "maturation" of its administrative institutions, and by the religion's worldwide expansion, followed by a transition into what he described a future "Golden Age" in which the Bahá'í Faith "is embraced by the majority of the peoples of a number of the Sovereign States of the world." In 1844 Siyyid `Alí-Muhammad of Shiraz, Iran proclaimed that he was "the Báb" ("the Gate"), after a Shi`a religious concept. His followers were therefore known as Bábís. As the Báb's teachings spread, the Islamic clergy saw it as a threat and Bábís came under increased persecution, at times being forced to choose between renouncing their beliefs or being killed. Several military confrontations took place between government and Bábí forces. The Báb himself was imprisoned and eventually executed in 1850. Bahá'ís see the Báb as the forerunner of the Bahá'í Faith, because the Báb's writings introduced the concept of "He whom God shall make manifest," a messianic figure whose coming, according to Bahá'ís, was announced in the scriptures of all of the world's great religions, and whom Bahá'u'lláh, the founder of the Bahá'í Faith, claimed to be in 1863. The Báb's tomb is located in Haifa, Israel, and is an important place of pilgrimage for Bahá'ís. The remains of the Báb were brought secretly from Persia to the Holy Land and were eventually interred in the Shrine built for them in a spot specifically designated by Bahá'u'lláh. Mírzá Husayn `Alí of Núr was one of the early followers of the Báb, who later took the title of Bahá'u'lláh. He was arrested and imprisoned for this involvement in 1852. He claimed that while incarcerated in the dungeon of the Síyáh-Chál in Tehran, he received the first intimations that he was the one anticipated by the Báb. He announced this in 1863. Shortly thereafter he was expelled from Persia to Baghdad, in the Ottoman Empire; then to Constantinople; then to Adrianople. During this time tensions grew between Bahá'u'lláh and Subh-i-Azal, the appointed leader of the Bábís, culminating in Bahá'u'lláh's 1866 declaration. While in Adrianople, he wrote letters to several rulers of the world, including Sultan Abdülâziz, declaring his mission as a Messenger of God. As a result Bahá'u'lláh was banished a final time, to the penal colony of Akká, in present-day Israel. Towards the end of his life, the strict and harsh confinement was gradually relaxed, and he was allowed to live in a home near `Akká, while still officially a prisoner of that city. He died there in 1892. Bahá'ís regard his resting place at Bahjí as the Qiblih to which they turn in prayer each day. During his lifetime, Bahá'u'lláh left a large volume of writings; the Kitáb-i-Aqdas, and the Book of Certitude are recognized as primary Bahá'í theological works, and the Hidden Words and the Seven Valleys as primary mystical treatises. Bahá'u'lláh was succeeded by his eldest son, `Abdu'l-Bahá in 1892, at a time when only a handful of Bahá'ís existed in the West. He was designated as the "Centre of the Covenant" and "Head of the Faith," Bahá'u'lláh designated him in his will as the sole authoritative interpreter of Bahá'u'lláh's writings. `Abdu'l-Bahá had shared his father's long exile and imprisonment. This imprisonment continued until `Abdu'l-Bahá's own release as a result of the Young Turk Revolution in 1908. Following his release he led a life of traveling, speaking, and maintaining correspondence with communities of believers and individuals, expounding the principles of the Bahá'í Faith. `Abdu'l-Bahá died in Haifa on November 28, 1921 and is now buried in one of the front rooms in the Shrine of the Báb. Bahá'u'lláh's Kitáb-i-Aqdas and The Will and Testament of `Abdu'l-Bahá are foundation documents of the Bahá'í administrative order. Bahá'u'lláh established the elected Universal House of Justice; and `Abdu'l-Bahá established the appointed hereditary Guardianship and clarified the relationship between the two institutions. In his Will, `Abdu'l-Bahá appointed his eldest grandson, Shoghi Effendi, as the first guardian of the Bahá'í Faith. Shoghi Effendi throughout his lifetime translated the sacred writings of the Faith; developed global plans for the expansion of the Bahá'í community; developed the Bahá'í World Centre; carried on a voluminous correspondence with communities and individuals around the world; and built the administrative structure of the faith, preparing the community for the election of the Universal House of Justice. He died in 1957 under conditions that didn't allow for a successor to be appointed. At local, regional, and national levels, Bahá'ís elect members to nine-person Spiritual Assemblies, which run the affairs of the religion. There are also appointed individuals working at various levels, including locally and internationally which perform the function of propagating the faith and protecting the community. The latter do not serve as clergy, which the Bahá'í Faith does not have. 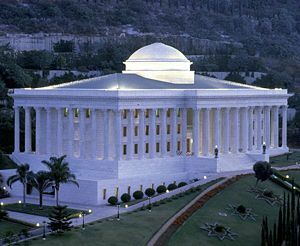 The Universal House of Justice today remains the supreme governing body of the Bahá'í Faith, and its nine members are elected every five years by the members of all National Spiritual Assemblies. Any male Bahá'í, 21 years or older, is eligible to be elected to the Universal House of Justice; all other positions are open to male and female Bahá'ís. Bahá'u'lláh prohibited a mendicant and ascetic lifestyle, encouraging Bahá'ís to "Be anxiously concerned with the needs of the age ye live in, and centre your deliberations on its exigencies and requirements." The importance of self-exertion and service to humanity in man's spiritual life is emphasized further in Bahá'u'lláh's writings, where he states that work done in the spirit of service to humanity enjoys a rank equal to that of prayer and worship in the sight of God. The Bahá'í International Community has offices at the United Nations in New York and Geneva and representations to United Nations regional commissions and other offices in Addis Ababa, Bangkok, Nairobi, Rome, Santiago, and Vienna. In recent years an Office of the Environment and an Office for the Advancement of Women were established as part of its United Nations Office. The Bahá'í Faith has also undertaken joint development programs with various other United Nations agencies. In the 2000 Millennium Forum of the United Nations a Bahá'í was invited as the only non-governmental speaker during the summit. See this article for further information on the relationship between the Bahá'í International Community and the United Nations. In 1939 Shoghi Effendi launched a seven year plan, followed by another in 1946. In 1953 he launched the Ten Year World Crusade, with extremely ambitious goals for the expansion of Bahá'í communities and institutions, the translation of Bahá'í literature into several new languages, and the sending of Bahá'í pioneers into previously unreached nations. He announced in letters during the Ten Year Crusade that it would be followed by other plans under the direction of the Universal House of Justice, which was elected in 1963 at the culmination of the Crusade. The House of Justice then launched a nine year plan in 1964, and a series of subsequent multi-year plans of varying length and goals followed, guiding the direction of the international Bahá'í community. Since the late 1990s, the House of Justice has been directing communities to prepare for large-scale expansion, organizing localities into "clusters," creating new institutions such as Regional Councils and strengthening the various "training institutes." The recently completed five-year plan (2001-2006) focused on developing institutions and creating the means to "sustain large-scale expansion and consolidation." Since 2001, the Bahá'ís around the world have been specifically encouraged to focus on children's classes, devotional gatherings, and a systematic study of the religion, known as study circles. A new focus was added in December 2005 with the addition of "junior youth" classes to the core activities, focusing on education for those between 11 and 14. The second five-year plan (2006-2011) was launched by the Universal House of Justice in April of 2006; it calls upon the Bahá'ís of the world to establish advanced patterns of growth and community development in over 1,500 "clusters" around the world. It also alludes to a possible tier-election process for Local Spiritual Assemblies in localities with many Bahá'ís. The years from 2001 until 2021 represent four successive five-year plans, culminating in the centennial anniversary of the passing of `Abdu'l-Bahá. Along with a focus on consolidation has come a system designed to systematically bring Bahá'í education to the grassroots level. The "study circles" are intended to be sustainable and self-perpetuating on a large scale. Participants complete a sequence of workbooks in small groups, facilitated by a tutor. Upon completion of the sequence, a participant can then go on to facilitate study circles for others. The most popular study program is the Ruhi Institute, a study course originally designed for use in Colombia, but which has received wide use. The first book studies three themes: the Bahá'í writings, prayer, and life and death. Subsequent themes include the education of children, the lives of the Báb and Bahá'u'lláh, service, and others. Recite an obligatory prayer each day after reaching the age of maturity, deemed to be 15. There are three such prayers among which one can be chosen each day. Backbiting and gossip is prohibited and denounced. Adult Bahá'ís in good health observe a 19-day sunrise-to-sunset fast each year from March 2 through March 20. Sexual relationships are permitted only between a husband and wife, and thus homosexual acts are not permitted. Most Bahá'í meetings occur in individuals' homes, local Bahá'í centers, or rented facilities. Worldwide, there are currently seven Bahá'í Houses of Worship, basically one per continent, with an eighth under construction in Chile. Bahá'í writings refer to an institution called a Mashriqu'l-Adhkár (“Dawning-place of the Mention of God”), which is to form the center of a complex of institutions including a hospital, university, and so on. Only the first ever Mashriqu'l-Adhkár in 'Ishqábád, Turkmenistan, was built to such a degree. Bahá'í marriage is the union of a man and a woman. Its purpose is mainly spiritual and is to foster harmony, fellowship and unity between the two partners. The Bahá'í teachings on marriage call it a fortress for well-being and salvation and place marriage and the family as the foundation of the structure of human society. Bahá'u'lláh highly praised the institution of marriage, declaring it an eternal command of God, also discouraging divorce, and requiring chastity outside of marriage; Bahá'u'lláh taught that a husband and wife should strive to improve the spiritual life of each other. The official symbol of the Bahá'í Faith is the five-pointed star, but a nine-pointed star is more frequently used. The ringstone symbol and calligraphy of the Greatest Name are also often encountered. 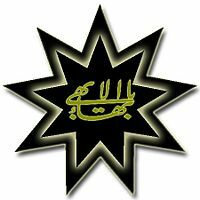 The former consists of two stars interspersed with a stylized Bahá’ (بهاء, "splendor" or "glory") whose shape is meant to recall the three onenesses. The Greatest Name is Yá Bahá'u'l-'Abhá (يا بهاء الأبهى "O Glory of the Most Glorious!"). The Bahá'í calendar is based upon the calendar established by the Báb. The year consists of 19 months of 19 days, with four or five intercalary days, to make a full solar year. The Bahá'í New Year corresponds to the traditional Persian New Year, called Naw Rúz, and occurs on the vernal equinox, March 21, at the end of the month of fasting. Bahá'í communities gather at the beginning of each month at a meeting called a Feast for worship, consultation and socializing. Each of the 19 months is given a name which is an attribute of God; some examples include Bahá’ (“Splendor”), ‘Ilm (“Knowledge”), and Jamál (“Beauty”). The Baha'i week is familiar in that it consists of seven days, with each day of the week also named after an attribute of God; some examples include Istiqlál (“Independence”), Kamál (“Perfection”) and ‘Idál (“Justice”). Bahá'ís observe 11 Holy Days throughout the year, with work suspended on nine of these. These days commemorate important anniversaries in the history of the faith. Bahá'ís continue to be persecuted in Islamic countries, especially Iran, where over two hundred believers were executed between 1978 and 1998. Since the Islamic Revolution of 1979, Iranian Bahá'ís have regularly had their homes ransacked or been banned from attending universities or holding government jobs, and several hundred have received prison sentences for their religious beliefs, most recently for participating in study circles. Bahá'í cemeteries have been desecrated and property seized and occasionally demolished, including the House of Mírzá Burzurg, Bahá'u'lláh's father. The House of the Báb in Shiraz has been destroyed twice, and is one of three sites to which Bahá'ís perform pilgrimage. Even more recently the situation of Bahá'ís has worsened; the United Nations Commission on Human Rights revealed an October 2005 confidential letter from Command Headquarters of the Armed Forces of Iran to identify Bahá'ís and to monitor their activities and in November 2005 the state-run and influential Kayhan newspaper, whose managing editor is appointed by Iran's supreme leader, Ayatollah Khamenei, ran nearly three dozen articles defaming the Bahá'í Faith. Due to these actions, the Special Rapporteur of the United Nations Commission on Human Rights stated on March 20, 2006 that she "also expresses concern that the information gained as a result of such monitoring will be used as a basis for the increased persecution of, and discrimination against, members of the Bahá'í faith, in violation of international standards. ... The Special Rapporteur is concerned that this latest development indicates that the situation with regard to religious minorities in Iran is, in fact, deteriorating." Bernard Lewis states that the Muslim laity and Islamic authorities have always had great difficulty in accommodating post-Islamic monotheistic religions such as the Baha'is, since on one hand the followers of such religions cannot be dismissed either as benighted heathens, like the polytheists of Asia and the animists of Africa, nor as outdated precursors, like the Jews and Christians. Moreover, their very existence presents a challenge to the Islamic doctrine of the perfection and finality of Muhammad's revelation. ↑ Bahá'ís prefer the orthographies "Bahá'í," "Bahá'ís," "the Báb," "Bahá'u'lláh," and "`Abdu'l-Bahá," using a particular transcription of the Arabic and Persian in publications. "Bahai," "Bahais," "Baha'i," "the Bab," "Bahaullah" and "Baha'u'llah" are often used when diacriticals are unavailable. ↑ 2.00 2.01 2.02 2.03 2.04 2.05 2.06 2.07 2.08 2.09 2.10 2.11 2.12 2.13 2.14 "The Bahá'í Faith," Encyclopaedia Britannica (Chicago, I.L., 1988, ISBN 0852294867). ↑ Shoghi Effendi, God Passes By (Wilmette, IL: Bahá'í Publishing Trust, 1944, ISBN 0877430209), 139. Available online. Retrieved August 18, 2007. ↑ 4.0 4.1 4.2 4.3 4.4 4.5 4.6 4.7 4.8 4.9 Manfred Hutter and Lindsay Jones (ed. ), “Bahā'īs,” Encyclopedia of Religion, 2nd ed. (Detroit, MI: Macmillan Reference, 2005, ISBN 0028657330), 737-740. ↑ 5.0 5.1 Juan Cole, “The Concept of Manifestation in the Bahá'í Writings,” Bahá'í Studies 9 (1982): 1-38. Available online. Retrieved August 18, 2007. ↑ Michael D. McMullen, The Baha'i: The Religious Construction of a Global Identity (Piscataway, NJ: Rutgers University Press, 2000, ISBN 0813528364), 7. ↑ `Abdu'l-Bahá, Selections From the Writings of `Abdu'l-Bahá (Wilmette, IL: Bahá'í Publishing Trust, 1978, ISBN 0853980810), 67. Available online. Retrieved August 18, 2007. ↑ Phillip R. Smith, “Baha'i Faith and Religious Diversity,” Bahá'í Studies Review 5(1) (1995). Available online. Retrieved August 18, 2007. ↑ “Worldwide Community,” Bahá'í International Community (2006). Retrieved August 18, 2007. ↑ “Worldwide Adherents of All Religions by Six Continental Areas, Mid-2002,” Encyclopædia Britannica (2002). Retrieved August 18, 2007. ↑ Major Religions of the World Ranked by Number of Adherents, adherents.com. Retrieved August 18, 2007. ↑ The World Book Encyclopedia, 2003 edition. ISBN 0716601036. ↑ Paul Oliver Teach Yourself World Faiths, New Edition (McGraw-Hill, 2002, ISBN 0071384480. ↑ 15.0 15.1 Principles of the Bahá'í Faith, bahai.com. Retrieved August 18, 2007. ↑ J. J. Dewey, The Gathering of Lights “The Three Revelations” (1999). Retrieved August 18, 2007. ↑ 17.0 17.1 Adib Taherzadeh, The Revelation of Bahá'u'lláh, Volume 1 (Oxford: George Ronald, 1976, ISBN 0853982708). ↑ Bahá'u'lláh, Epistle to the Son of the Wolf (Wilmette, IL: Bahá'í Publishing Trust, 1988 (original 1892), ISBN 0877431825), 13. Available online. Retrieved August 20, 2007. ↑ Adib Taherzadeh, The Covenant of Bahá'u'lláh (Oxford: George Ronald, 1972, ISBN 0853983445). ↑ 20.0 20.1 20.2 20.3 Moojan Momen, “Covenant, The, and Covenant-breaker,” Bahá'í Library Online. Retrieved August 20, 2007. ↑ 21.0 21.1 Shoghi Effendi, 324. ↑ Shoghi Effendi, The World Order of Bahá’u’lláh (Wilmette, IL: Bahá'í Publishing Trust, 1938, ISBN 0877432317), 7. Available online. Retrieved August 20, 2007. ↑ Jonah Winter, “Dying for God: Martyrdom in the Shii and Babi Religions,” Master of Arts Thesis, University of Toronto, 1997. Retrieved August 20, 2007. ↑ 24.0 24.1 24.2 Hasan Balyuzi, `Abdu'l-Bahá: The Centre of the Covenant of Bahá'u'lláh (Oxford: George Ronald, 2001, ISBN 0853980438). ↑ 25.0 25.1 25.2 "Baha'-allah," Encyclopædia Iranica, 1989. ↑ Bahá'u'lláh, Tablets of Bahá'u'lláh Revealed After the Kitáb-i-Aqdas (Wilmette, IL: Bahá'í Publishing Trust, 1994 (original 1873-1892), ISBN 0877431744), 217. Available online. Retrieved August 20, 2007. ↑ 27.0 27.1 27.2 27.3 27.4 J. E. Esslemont, Bahá'u'lláh and the New Era, 5th ed. (Wilmette, IL: Bahá'í Publishing Trust, 1980, ISBN 0877431604). Available online. Retrieved August 18, 2007. ↑ Robert Stockman, “Bahá'í Faith: A Portrait” in A SourceBook for Earth's Community of Religions, edited by Joel Beversluis (Grand Rapids, MI: CoNexus Press, 1995, ISBN 0963789716). ↑ Bahá'u'lláh, Proclamation of Bahá'u'lláh (Wilmette, IL: Bahá'í Publishing Trust, 1991, ISBN 0877430640), 122. Available online. Retrieved August 20, 2007. ↑ 30.0 30.1 History of Active Cooperation with the United Nations, Bahá'í International Community. Retrieved August 20, 2007. ↑ Bahá'í World News Service, “Bahá'í United Nations Representative Addresses World Leaders at the Millennium Summit,” Bahá'í International Community (September 8, 2000). Retrieved August 20, 2007. ↑ Helen Danesh, John Danesh and Amelia Danesh, "The Life of Shoghi Effendi," in Studying the Writings of Shoghi Effendi, edited by M. Bergsmo (Oxford: George Ronald, 1991, ISBN 0853983364). ↑ Graham Hassal, “Baha'i History in the Formative Age,” Journal of Bahá'í Studies 6(4) (1996): 1-21. ↑ Moojan Momen and Peter Smith, “The Baha'i Faith 1957-1988: A Survey of Contemporary Developments,” Religion 19: 63-91. ↑ 35.0 35.1 Universal House of Justice, “January 17, 2003” Retrieved August 20, 2007. ↑ 36.0 36.1 36.2 Universal House Of Justice, Five Year Plan 2006-2011 (West Palm Beach, FL: Palabra Publications, 2006). ↑ 37.0 37.1 Universal House of Justice, The Kitáb-i-Aqdas, “Introduction” (Wilmette, IL: Bahá'í Publishing Trust, 1992, ISBN 0853989990), 5. Available online. Retrieved August 20, 2007. ↑ Shoghi Effendi and The Universal House of Justice, Lights of Guidance: A Bahá'í Reference File, edited by Helen Hornby, (New Delhi: Bahá'í Publishing Trust, 1983, ISBN 8185091463), 233. Available online. Retrieved August 20, 2007. ↑ John Walbridge, “Prayer and Worship,” Bahá'í Library Online. Retrieved August 20, 2007. ↑ Universal House of Justice (1991-12-9). Letter to a National Spiritual Assembly. bahai-library.org. Retrieved 2006-07-11. ↑ Bahá'u'lláh, The Kitáb-i-Aqdas: The Most Holy Book (Wilmette, IL: Bahá'í Publishing Trust, 1992 (original 1873), ISBN 0853989990), 21. Available online. Retrieved August 20, 2007. ↑ Adherents.com, Baha'i Houses of Worship, Retrieved August 20, 2007. ↑ 43.0 43.1 Local Spiritual Assembly of the Baha'is of Warwick, Baha'i Marriage. Retrieved August 20, 2007. ↑ Bahá’í Publishing Trust, “Bahá'í Marriage and Family Life: Selections from the Writings of the Bahá'í Faith.” Retrieved August 20, 2007. ↑ Bahá'u'lláh, The Kitáb-i-Aqdas: The Most Holy Book, 105. Retrieved August 20, 2007. ↑ Shoghi Effendi, Lights of Guidance: A Bahá'í Reference File, edited by Helen Hornby (New Delhi: Bahá'í Publishing Trust, 1983, ISBN 8185091463). Available online. Retrieved August 20, 2007. ↑ Abu'l-Qasim Faizi, Explanation of the Symbol of the Greatest Name (New Delhi: Bahá'í Publishing Trust, 1968). Available online. Retrieved August 20, 2007. ↑ “Discrimination against religious minorities in Iran,” International Federation for Human Rights (August 2003). Retrieved August 20, 2007. ↑ Committee on the Rights of the Child, “Iran, Islamic Republic of,” Netherlands Institute of Human Rights. Retrieved August 20, 2007. ↑ Religion News Service, “Bahá'í International Community dismayed at lack of Human Rights Resolution on Iran,” Bahá'í International Community (April 14, 2005). Retrieved August 20, 2007. ↑ 51.0 51.1 Asma Jahangir, “Special Rapporteur on Freedom of religion or belief concerned about treatment of followers of Bahá'í Faith in Iran,” United Nations (March 20, 2006). Retrieved August 20, 2007. ↑ Michael Rubin, “Iran Means What It Says,” Middle East Forum (January 25, 2006). Retrieved August 20, 2007. ↑ “The press in Iran,” BBC News (August 16, 2005). Retrieved August 20, 2007. ↑ “Summary and Analysis of Recent Media Attacks,” Bahá'í International Community. Retrieved August 20, 2007. ↑ Bernard Lewis, The Jews of Islam (Princeton, NJ: Princeton University Press, 1984, ISBN 0691008078), 21. `Abdu'l-Bahá. A Traveller's Narrative: Written to Illustrate the Episode of the Bab. Translated by E. G. Browne. Cambridge: Cambridge University Press, 1891. Available online. Retrieved August 20, 2007. `Abdu'l-Bahá. The Will And Testament of ‘Abdu’l-Bahá. Mona Vale, N.SW: Bahá'í Publications Australia, 1992 (original 1901-1908). ISBN 0909991472. Available online. Retrieved August 20, 2007. Universal House of Justice. Century of Light. 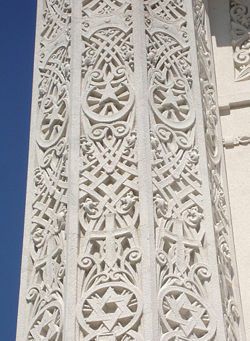 Wilmette, IL: Bahá'í Publishing Trust, 2001. ISBN 0877432945. Available online. Retrieved August 20, 2007.